The movement known as the gilets jaunes (yellow vests) began as an outcry through social media networks with a mass petition against the increase in tax on petrol and diesel. 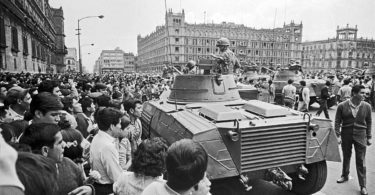 But it rapidly passed over into a wave of militant protests in towns and cities across the entire country, with the setting up of road-blocks on highways and barricades barring access to fuel storage facilities. As the protest gained momentum, it became clear that the issues being raising went well beyond petrol prices and taxes. Various lists of demands have been published, covering a wide variety of subjects. The demands reflect the presence of different and to some degree conflicting political tendencies. Taken as a whole, however, they express profound hostility to the existing social order, and a pressing need for the radical transformation of society. The organisational form of the movement means that it is not possible to put accurate figures on the scale of participation. What is certain, however, is that the people directly or indirectly involved in the protests numbered at least 200,000 to 300,000 on each day. All opinion polls have shown crushing majorities in popular support for their aims, generally ranging from 75% to 84% of the population. Impressive as these figures are, such massive support would, in itself, indicate a coalition of favourable opinions formed on the basis of very different political inclinations. A poll published on the website of the radio station France Info indicates that 90% of traditional left-wing voters support the gilets jaunes, together with 75% of the right-wing electorate and even 50% of supporters of Macron’s own party. 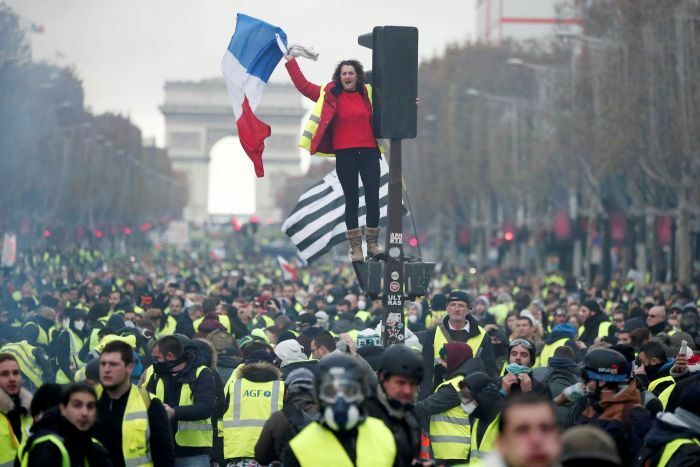 Contradictory trends have been present, to some degree or other, on all barricades and on street demonstrations of the gilets jaunes, ranging from extreme right-wing nationalism to left-wing, anarchist and revolutionary leanings at the other extreme. Among the articles published by the various left groupings, most of which are not actively involved either in the organised workers’ movement or in protests, we can read comparisons between this mass movement and that of May-June 1968, just as we can read that it is essentially ‘fascist’ or ‘poujadiste’ (a movement of the 1950s based largely on the rural right-wing), or an expression of the ‘enraged petite-bourgeoisie’. The few reactionary trends which have a marginal existence within the gilets jaunes movement have made some PCF and trade-union militants reticent about expressing any formal support for it, although the CGT, the PCF and the left-wing party led by Jean-Luc Mélenchon, La France Insoumise, have all correctly recognised that this is essentially a mass movement driven by desperation and anger over falling living standards and social injustice, and they have therefore given their support, while at the same time dissociating themselves from the minority racist and reactionary trends within it. The confusion over the character of the movement arises from the fact that it is, in reality, a coalition of various political and social forces, whose strands are as yet still too intertwined to permit a clear description of the movement as a whole. The majority of the gilets jaunes are wage-workers who in spite of long hours in mainly manual jobs are finding it increasingly difficult to find decent housing and properly-paid stable employment to feed, clothe and offer a viable future to their families. That is the root cause of this movement, without the slightest doubt. And the fact that some groups of employers and right-wing nationalist organisations have tried, here and there, to exploit it for their own reactionary ends does not change this fact. When building industry employers, caring little for the problems of the workers and angling for tax concessions specifically for themselves, lend machinery and vehicles to serve in barricades and roadblocks, the workers grasp this help with both hands. But talk to them and you will see that they know these are unreliable allies, and that fear of betrayal makes them seek more active support from other workers and students. This is not anything like what happened in 1968, which was the culmination of a steady rise in organised working class militancy during the first decade of the Gaullist régime, and triggered by massive student protests. The movement of the gilets jaunes is very different. The wage-workers who form the backbone of the movement are drawn from the swelling ranks of the unorganised working poor. 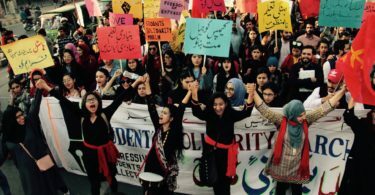 They are overwhelmingly new to politics and active protest, and unfamiliar with the crystallised ideological and political trends that are ordinarily confined to a thin layer of regular activists. Most of them live in the lesser developed regions of France, where public services – including public transport – are scarce. For them, increases in prices hit hard, as do increases in taxes, especially because they see no benefits from taxes in terms of public services and the development of local infrastructure. The pressure on living standards has stirred up the ordinarily invisible and silent depths of society and brought them to the surface. The ideas of these people have not been fashioned in fancy debates, with articulate speakers and raised hands for questions and contributions, nor by books on history and philosophy. And so, yes, they may appear to some self-proclaimed ‘revolutionary theorists’ as rather unpolished, given to one-sided views and guilty of occasional racist or sexist remarks. But be that as it may, they have become engaged in a bitter struggle, in a revolt of proportions not seen for decades. Their views are not fixed once and for all. They will draw conclusions from the present struggle. The different strands within the movement will unravel in time. As to the nature of their conclusions and relative strength of the different political tendencies taking shape as a result of the present events, that is still an open question. A proportion of the workers manning the barricades may have voted for the Rassemblement National (formerly the Front National). This does not mean they are consciously racist and reactionary. Many such people could and should be won over to the labour movement. It is possible that the movement of the gilets jaunes will prove to be a prelude to a new upsurge in organised militancy. On the other hand, it is possible that the nationalist and xenophobic trends in society could be strengthened, to the detriment of our cause. There is nothing inevitable about the triumph of socialist ideas. The consciousness of the workers depends upon a struggle of living forces. And struggles can be won or lost. To turn our backs on the gilets jaunes, to write them off as ‘petit-bourgeois’, ‘fascists’ or ‘poujadistes’, would be a grave mistake. An examination of the main demands which have come to the surface in the course of the movement shows that most of them express an attempt to reduce the precariousness of working class life, to improve the conditions and the net income of workers and to attack the privileges and power of the ruling elites. Demands include the call for a general reduction of taxes – not just on petroleum products – and an increase in pensions, an increase in the minimum wage, real quality of pay for men and women, an increase in housing benefits and financial help for students. The demand for an end to special pension schemes (such as the one railway workers are trying to defend) is there, but this is followed by the demand for the same method of calculation for all pensions, all of which should be higher. They call for the inclusion of disabled people in all aspects of social life and for an access to culture for all. One of the most important parts of the list of demands handed to the government was about the organisation of government. They call for a reduction of the wages paid to members of the government, for the abolition of privileges such as the payment for stipends to ministers even when they are no longer in office, for an end to fake jobs created for friends and relatives, and insist on the strict control of the personal expenses for politicians. They also demand that members of parliament actually attend parliamentary sessions. Further demands include the convocation of a citizens’ assembly, more frequent consultation of the people by referendum, the abolition of the Senate, and the promulgation of laws by the people. Significantly, there are demands for the protection of the environment, giving the lie to the propaganda of the government claiming that the revolt is against ecological concerns. It is true that one of the lists of demands published in the press says that refugees who have been denied asylum should be sent back to the country they came from, and those other ideas put forward are of a racist and nationalistic character. But overall, it is clear that this general platform, notwithstanding some isolated demands that socialists would oppose, has nothing to do with ‘fascism’ and does not represent a reactionary movement. Macron was elected by default. The electoral base of his own party was something like 25% of active voters. He only won because the second round of the presidential election was a choice between him and Marine Le Pen. Since that time, what little support there was for his policies has largely collapsed. Macron puts himself forward as the man who will balk at nothing in pushing through his program of counter-reforms in the interests of big business. He rode roughshod over the national leaders of the trade union organisations. Nothing was to be negotiated. He would only consult with them, to tell them what was going to be done to reduce workers’ rights. He attacked railway workers’ conditions, cut pensions, reduce taxes for the rich and – as the petrol tax shows – increase the tax burden on the poor. Hospitals and schools and local authorities are starved of resources. More than 5 million are out of work. His arrogance and brazen contempt for the ordinary people has been amply demonstrated on many occasions, such as when he told a young unemployed man that he only had to ‘cross the street’ to find a job if he really wanted one. The attempt to justify the fuel tax increases on ecological grounds is completely spurious. The idea is that if petrol is more expensive, more people will leave their car at home and take public transport. But in many areas, no regular or reliable public transport is available. People have no alternative to cars. Also, many formally self-employed workers use their vehicles as part of their work. The gilets jaunes took Macron and his government completely by surprise. His ministers have branded the movement as the work of the extreme right. But this is a ploy intended to drive a wedge between the left and militant unions such as the CGT (trade union federation), on the one hand, and the demonstrators on the other. It is possible that the government could capitulate and withdraw the tax. But a great deal is at stake for them. Backing down would encourage large-scale protest movements on other issues. So far, Macron is trying to weather the storm in the hope that it will blow over before too long. He also hopes the violent behaviour of some elements among the gilets jaunes, but mainly of organised groups outside of the movement, will erode popular support. One of the difficulties he has is that this movement has no recognised leaders. The individuals who have been invited to discuss with the government have all emphasised the fact that they have no mandate and no authority to speak or decide anything on behalf of the movement as a whole. Whatever the outcome of the present struggle, the events of these last few weeks are a symptom of the unbearable social and economic consequences of modern capitalism, which can only continue at the expense of the living standards, the rights and prospects of a growing proportion of society, and by the steady erosion and destruction of the social conquests of organised labour. This cannot go on forever without provoking a major social upheaval at some point, on a much greater scale than we are seeing at the present time. All over Europe, the social consequences of austerity are driving millions of people towards nationalist and reactionary demagogues. This has also been the case in France. Workers have seen right and left governments come and go, applying policies that are very similar on all fundamental questions, and presiding over a general decline in the living conditions of the mass of the people. They have also seen that trade-unionism, while it may have weakened the impact of some of the blows directed against them, has not prevented those blows and has delivered no blows in return. Workers are desperate and impatient for change and for concrete results. This explains the insurrectionary mood of many on the barricades and the demonstrations of these last few weeks. The workers’ movement must find a way to channel and organise this yearning for change, otherwise, the nationalists will make considerable gains in the future. The nationalist right-wing is taking advantage of the political and organisational weaknesses of the workers’ organisations, which are hampered by a narrow reformist outlook. Changes in the Communist Party (PCF) spearheaded by the party leadership in the 1990s, led to a dilution of the party program and acceptance of pro-capitalist policies, to the point of approving and even directly organising a number of major privatisations under the Jospin government of 1997-2002. This seriously weakened the position of the Party within the most conscious and militant section of the working class and, by extension, within the class as a whole. Now, at last, there is pressure within the ranks of the PCF to move back in the direction of presenting an alternative to capitalism. But the weakened organisational base of the Party – with just 50,000 paid up members – has become a major obstacle to be overcome before the PCF can appear as a strong and effective militant organisation in the eyes of the mass of the working people. It cannot be ruled out that Mélenchon at the head of La France Insoumise could win the next presidential election. It is too early to say and the situation in the country is too volatile, to speculate about what will happen three years from now. Even if Mélenchon did win, he would rapidly abandon the most progressive elements of his program, which further underlines the imperative need for an alternative political force to the left of La France Insoumise. In spite of all the difficulties – and there are many – no other organised forces in French society are better placed to fulfill this role than the PCF and the CGT.